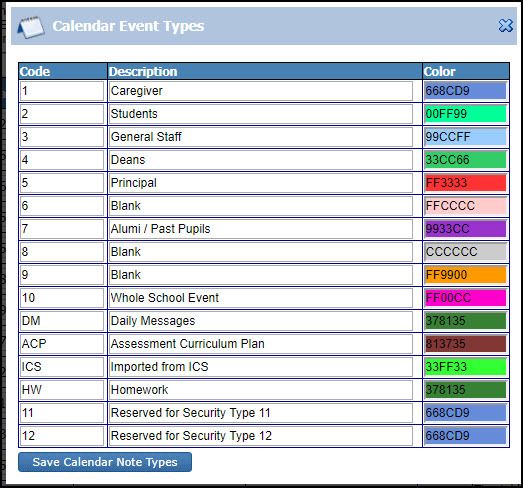 The following security objects are required to use Calendar– security for the Calendar are the same as those in the Back Office, so staff should not need additional security to manage the same attendance processes in. 459 Calendar Setup Administrators use this to add, propagate holidays and calendar. Year Level and subjects studied by the student. Entries relevant to the students in the family. Interviews booked through the Parent Teacher Interview Scheduler will automatically show for the relevant care giver and teacher. You will now need to select what calendar types you wish each group to see.